Oral paste for horses containing 18.92mg/g moxidectin for the treatment and control of large and small redworms, pinworms, stomach worms, intestinal threadworms and bots. 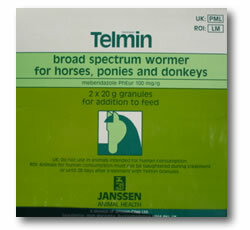 For oral treatment of Praziquantel sensitive cestodes (Tapeworms) in Horses. One syringe per 600 kg weight. Each gram of Equimax contains: Ivermectin ph. Eur. 18.7mg; Praziquantel Ph. Eur. 140.3mgone syringe is sufficient to treat a 600kg horse. 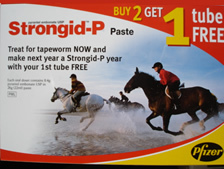 For the treatment of infestations due to adult and immature roundworms, lungworms, bots and tapewormsin Horses. Each syringe contains 1.87% ivermectin paste in an easy to administer syringe. One syringe is sufficient to treat a 600kg horse. One syringe contains 1.55% ivermectin and 7.75 praziquantel. For the treatment and control of tapeworms, large and small strongyles, hairworms, pinworms, roundworms(ascarids), neck threadworms, intestinal threadworms, large-mouth stomach worms, bots, lungworms and cutaneous onchocerchiasis in equids. Each syringe treats up to 600kg. Oral paste for horses containing 1.87% ivermectin for the treatment and control of adult and immature roundworms, lungworms and bots. Bimectin is a ready-to-administer, 18.7mg/g oral paste formulation of Ivermectin PhEur. For the treatment and control of small redworms (adult and immature), large redworms - adult and 4th larval (arterial), pinworms, lungworms, ascarids, stomach worms, intestinal threadworms, cutaneous worms and bots. One syringe treats 600kg bodyweight. Ivermectin Paste 1.87% for the treatment of adult and larval stages of small redworms, arterial stages of large redworms, lungworms and bots with a single dose. 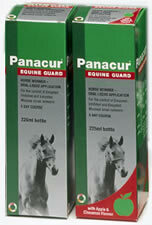 Oral paste for horses containing 18.75% fenbendazole for the treatment and control of adult and immature roundworms. Oral granules for horses containing 18.75% fenbendazole for the treatment and control of adult and immature roundworms. Each syringe contains 11.4g pyrantel embonate USP as active ingredient. For the treatment and control of adult infections of large and small redworms, ascarids and pinworms found in the gastro-intestinal tract of horses and other equines. Also treats and controls tapeworm when given at a double dose rate. One syringe treats 600kg bodyweight as a single dose or at double tapeworm dose one syringe treats 300kg bodyweight. Oral paste for horses containing 11.4g pyrantel embonate for the treatment and control of large and small redworms, pinworms and tapeworms. 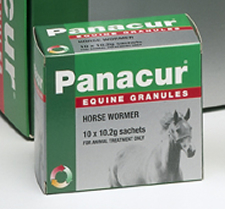 Oral granules for horses containing 43.9% w/w pyrantel embonate for the treatment and control of redworm, seatworm/pinworm, roundworm and tapeworm. Each syringe contains 11.4g Pyrantel Embonatefor the treatment and control of large and small redworms, ascarids and pinworms. Exodus also treats and controls tapeworm infections if given at a double dose. One syringe treats 600kg at a single dose or 300kg at a double dose. White granules containing 2g mebendazole per sachet for the treatment of large and small strongyles, ascarids, pinworms and lungworms in horses and donkeys. A white paste containing 4 g mebendazole per syringe for the treatment of large and small strongyles, Ascarids, Pinworms and Lungworms in horses and donkeys. Alternative worming remedy. Endo parasites infest the digestive tract of all equines, causing distress and loss of condition. 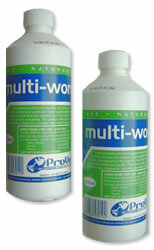 Used regularly, multiworm creates an alien environment in the digestive tract, thus expelling larvae abd adult worms quickly and gently. Can be added to drinking water or mixed in moist food. Heavy horses 100ml monthly, horses 75ml monthly, ponies 50ml monthly.